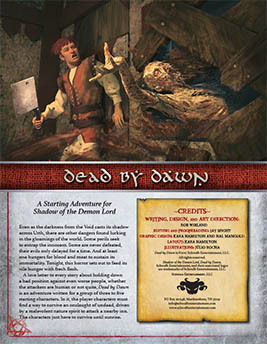 Buy Dead by Dawn as a PDF from Schwalb Entertainment or DriveThruRPG! 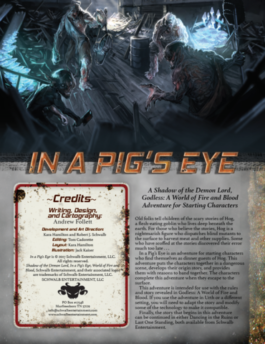 If you loved Godless, you’ll love In a Pig’s Eye, Last One Standing, and Dancing in the Ruins: three adventures set in the world of fire and blood. You can find detailed information on each adventure here. 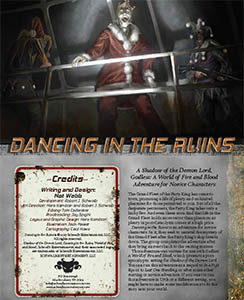 Grab your copies of In a Pig’s Eye, Last One Standing, and Dancing in the Ruins today! The vale was meant to be their safe retreat, but they didn’t count on the woods. Five years ago, pilgrims established the tiny village of Respite in the idyllic Orborous Vale on the western edge of the Dark Forest, a stretch of evil wood found in the Northern Reach. At first, the land was good to them and fruitful, yielding rich harvests and allowing their livestock to flourish. The sun rose every morn with great beauty and life-giving warmth, and all was good and peaceful for the fifty or so souls that called Respite home—so long as they did not venture into the shadowed wood just beyond their border. As the years passed, however, all that began to change, though the village elders could no longer point to a single event to mark the shift. The soil thinned and ceased to yield the abundance it once had. Now, the village’s crops molder on the vine, their root vegetables emerge from the ground spindly and bleeding, and their blighted herb plants taste like ash and vomit. Flowers wither to brown and black within moments of being cut. Goats give bloody milk floating with pus, and their weak cows sometimes bear calves with too many limbs or a second head. Now, the village treads perilously close to starvation, and tempers are rising. 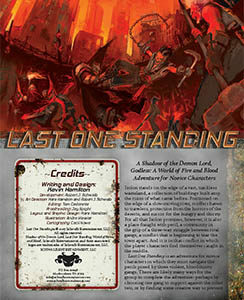 Some believe the New God has abandoned them, while others blame the misfortunes on a nearer threat. Mayor Rickard Bailey and the elders of the Dawn Seekers have long forbidden anyone to venture into the wood. Only the strongest members of the village venture beneath the looming branches among the scintillating shadows, armed with what weapons they can muster to trap and hunt game in the uncertain darkness. 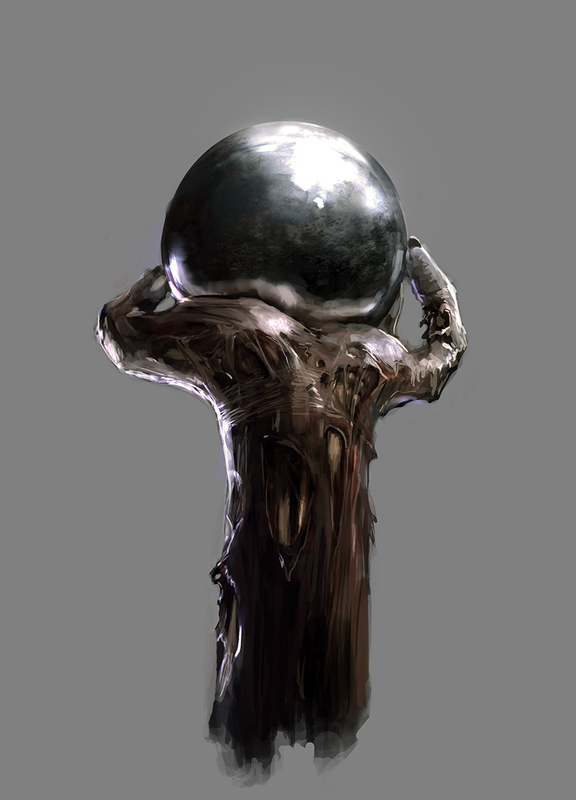 Rumors and village tales abound about strange creatures that dwell in the wood, and the children of Respite are warned to mind themselves, or else a terrible witch will come for them. The villagers are more right than they know. The Witching Wood is an adventure for starting characters. In it, the characters must come together to find the source of the troubles besetting Respite and drive it away. If they succeed, the crucible of shared experience combines them into a group and sets the stage for even greater adventures. 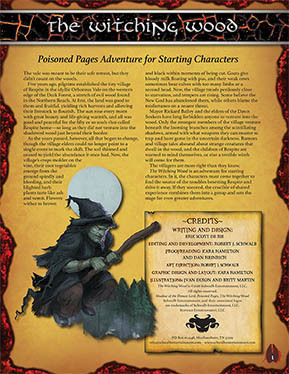 Pick up Witching Wood for your starting Characters as a PDF from Schwalb Entertainment or DriveThruRPG! The emperor’s death and the subsequent collapse of the Empire loosed rampaging bands of orcs into the Empire’s provinces. While many of these orcs seek the freedom long denied to them, others see opportunity for vengeance, wealth, and power. In this adventure, a band of orc slavers has moved into the Northern Reach, plundering frontier towns for slaves to sell or use for sport. When the adventure opens, the characters are among the captives, marching toward a life in chains. 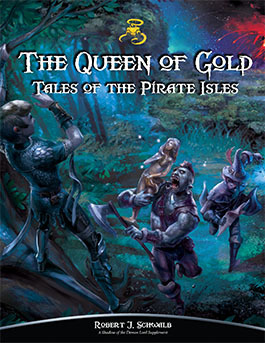 The adventure ends when the characters escape captivity and reach one of the few outposts of civilization on the frontier. 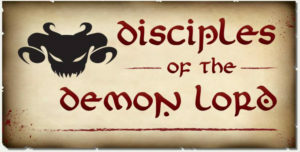 The Slaver’s Lash is an adventure for starting characters for Shadow of the Demon Lord RPG. Like others of its kind, it helps you and your players determine the group’s origin story, how they come together and how they will develop their stories over time. The characters can know each other before the adventure begins, but it’s better if they don’t. 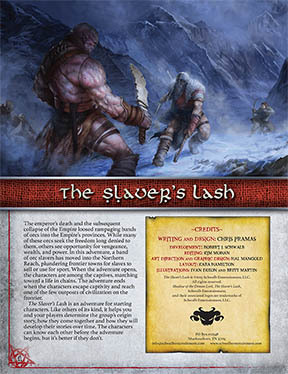 Buy Slaver’s Lash as a PDF from Schwalb Entertainment or DriveThruRPG!